New England natives have strong opinions on Dont’a Hightower, with crucial plays from Super Bowls 49 and 51 etched in their memory. As the linebacker makes his free agency tour, how do western PA writers and fans view the potential of seeing Hightower wearing black and gold at Heinz Field? The Steelers, at some point, are going to have to replace Lawrence Timmons, and they’re reportedly setting their targets high. Like, “stealing a Pro Bowler from the team that beat them in the AFC championship” high. The Steelers have the cap space necessary to make a competitive offer. Hightower is a better pass rusher than Timmons but probably worse in coverage, so it’d be an interesting trade-off; it’d likely take $50 million or so over five years to bring him in, but you’d also be keeping him away from New England. So, maybe call it a wash.
It’s not that the Steelers don’t like or don’t trust Vince Williams, the heir apparent to Lawrence Timmons, who signed a two-year, $12-million free-agent contract with the Miami Dolphins last week. Williams, who received a three-year, $5.5 million extension in September, remains a viable option. Hightower is an upgrade though. 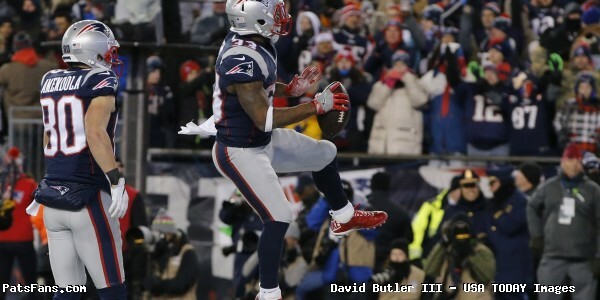 Hightower is seen as a three-down player who has saved some of his best performances for the biggest games, including two, game-changing plays in each of the Patriots’ last two Super Bowl wins. A potential pairing with Ryan Shazier, another fast, physical inside linebacker, in Pittsburgh is intriguing. The knock against Hightower is that he has yet to play a full 16 games. He has missed 13 regular-season games in career due to various injuries. He has 13 passes defensed and zero interceptions. 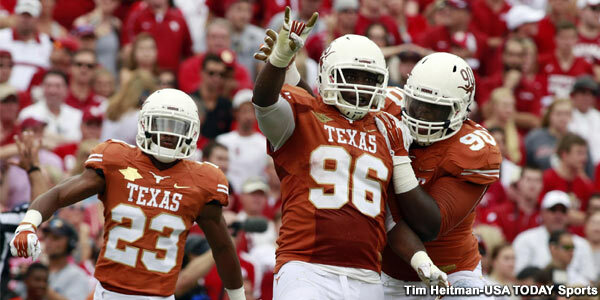 Whatever flaws, however minor, are outweighed by Hightower’s 251 solo tackles and 17 sacks. And there’s this: As they were in 2016, the Patriots are all that is standing in the way of the Steelers and a potential trip to Super Bowl 52. Anytime you can take a great player away from New England, it can only help the Steelers. The Pittsburgh Steelers currently find themselves in an exploratory phase as they seek out their options on how to replace starting buck inside linebacker Lawrence Timmons, and there are several options. The most immediate and readily available option to replace him is to simply plug Vince Williams into the starting lineup, but they do not seem content just yet to rely upon that. They could use the draft to replace him, but they have perhaps an even bigger immediate—and certainly long-term—need at the outside linebacker position, and this is with consideration of the fact that they have used their past three first-round draft picks prior to last season on linebackers. Or they could replace (Timmons) the same way that they lost him—free agency. And they are bringing in for a visit a player that their defensive coordinator once “pounded the table” for in the draft room in 2012: Patriots free agent Dont’a Hightower. Keith Butler was the linebackers coach at that time in 2012, but he admitted in training camp later that year that he wanted Hightower in that draft, with the team instead taking David DeCastro. This was just a month or so after the Steelers released James Farrior, one should keep in mind. The addition of Hightower would be a huge upgrade for the Steelers defense. With the defense improving with its young core of players such as Ryan Shazier and Bud Dupree, Hightower would provide experience and leadership. 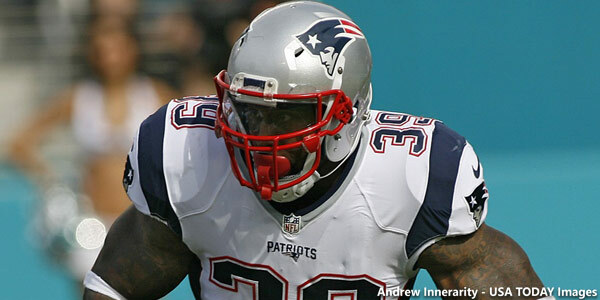 Hightower has played five seasons in the league for the Super Bowl champion New England Patriots. With that being said, he can help to show the young guys what it takes to win. With Lawrence Timmons leaving for Miami, the Steelers need to find another inside linebacker to pair with Shazier. Timmons was one of the leading tacklers for Pittsburgh over the past ten years as he accounted for 981 tackles and 12 interceptions (one for a touchdown). The next man up at the inside linebacker position would be Vince Williams who has had some experience. However, it has mainly been on special teams and sparingly in the linebacker rotation. With that being said, Timmons will be leaving behind big shoes to fill. However, I believe that Hightower would be the perfect replacement. Even if Hightower did join the Steelers, he wouldn’t be a like-for-like replacement for (Jarvis) Jones, who plays on the edge, while Hightower generally plays inside. And Jones has never quite lived up to being the No. 17 overall pick in the 2013 draft, either. Last season, (Jones) registered 43 tackles, a sack, two forced fumbles and a fumble recovery. In four seasons, he’s managed just six sacks and has never been more than a rotational outside linebacker for the Steelers. While he is solid against the run, he doesn’t provide the sort of game-changing ability to pressure the passer he was drafted to provide. So the Steelers could see some big changes in the linebacker group next year, and while Hightower seems likely to return to New England, the thought of pairing him with Ryan Shazier in Pittsburgh’s defense has to send shivers running down the spines of NFL offensive coordinators. The latest marquee free agent to be linked to the Pittsburgh Steelers is former New England Patriots linebacker Dont’a Hightower. Outside linebacker and cornerback are the two primary needs of the Steelers and so it makes sense there would be interest. But if you believe the projected money figure floating around, there’s little chance the Steelers will be interested. 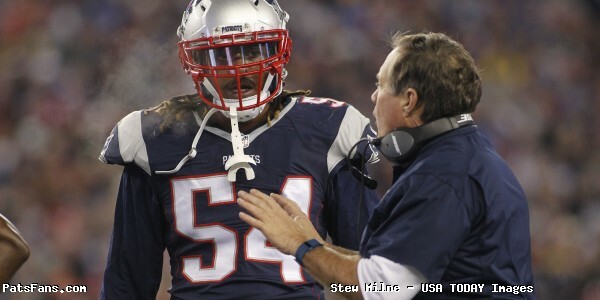 Hightower has started at outside linebacker for the Patriots for the bulk of his five seasons. He’s been a steady contributor but in terms of impact plays, he really hasn’t stood out. The Steelers need to bring in an outside linebacker who can rush the passer on a consistent basis. 17 sacks in five seasons does not scream pass rusher to me. This really feels like Hightower is making the rounds just to come back and get paid from the Patriots. If the Steelers weren’t going to pay $10 million per season for a top-tier cornerback, would they do it for a run-stuffing linebacker with limited pass-rush skills. Perhaps the author was out in the kitchen grabbing a brew and some grub during SB 49 and 51, and missed certain ‘impact plays’ . He may also want to dig a bit deeper in his research on how Hightower is utilized in Foxboro, the contrast between the defensive schemes in Pittsburgh and New England, and brush up on the differences between 3-4 and 4-3 (or 4-2) defenses. To see how Steeler fans feel about Hightower, check out the comments sections on the articles linked above. The most common sentiment seems to be that Pittsburgh will not sign Hightower, as the Steelers are traditionally not a big player in free agency. This entry was posted in 2017 Free Agency, NFL Commentary, Patriots Commentary and tagged 2017 free agency, 2017 NFL Free Agency, 2017 Patriots Free Agency, 2017 Patriots free agents, Dont'a Hightower, free agency, free agents, Linebacker, Patriots free agents, Pittsburgh Steelers on March 14, 2017 by John Morgan. With the start of the 2017 National Football League year just days away, below is a list of key dates for NFL and Patriot fans. Even though training camp is four months away, crucial decisions in the upcoming free agency and next month’s draft will have a critical impact on next season’s success for all 32 teams. All deadlines are 4:00 pm eastern time unless noted otherwise. Feb 28 – March 6: NFL Scouting Combine, Indianapolis IN. Wed March 1: Deadline for teams to apply franchise or transition tag to impending free agents. Sat March 4: Regional Combine, Eden Prarie MN. March 7-April 7: College Pro Day workouts. March 7-9: Legal Tampering Period. Teams are permitted to contact, and enter into contract negotiations with the certified agents of players who will become Unrestricted Free Agents upon the expiration of their 2016 Player Contracts. March 9: At 4:00 pm the 2016 league year ends, and the 2017 league year commences with the start of free agency. Thu March 9: Unrestricted Free Agents: All 2016 player contracts expire. Thu March 9: Option Clauses. Deadline for teams to exercise options for 2017 on all players who have option clauses in their 2016 contracts. Thu March 9: Restricted Free Agents. Deadline for teams to submit qualifying offers to their RFA with expiring contracts and to whom they desire to retain a Right of First Refusal/Compensation. Thu March 9: Exclusive Rights Free Agents. Deadline for teams to submit a Minimum Salary Tender to retain exclusive negotiating rights to their players with expiring 2016 contracts and who have fewer than three accrued seasons of free agency credit. March 9: Top 51. All teams must be under their salary cap, with only the top 51 players counting against the cap. March 9: Trading Period. After 4:00 pm when 2016 contracts expire, teams can make trades. Sat March 11: Regional Combine, Metairie LA. March 26-29: Annual League Meeting, Phoenix AZ. Mon April 3: Teams that hired a new head coach may begin offseason workout programs on the first Monday of April. Mon April 10: NFL preseason schedule announced. Preseason nationally televised games are announced with exact date and time. All other games are announced only by the week, with exact date and time released about a 7-10 days later. Wed April 12: Patriots Hall of Fame Nomination Committee meets to select three finalists for this year’s fan election process. In all phases of OTAs there are a maximum of four workouts per week, none on the weekend. Contact work such as tackling and blocking is prohibited. Mon April 17: New England Patriots’ offseason conditioning program commences. Tue April 18: Annual pre-draft press conference from Pats’ director of player personnel Nick Caserio, starting at 11:30 am. Wed April 19: Patriots Super Bowl 51 team honored at the White House. Thu April 20: 2017 NFL Schedule announced. Fri April 21: Patriots announce three finalists for the team’s Hall of Fame; fan voting commences, concluding on May 15. The winner will be announced about a week later and the induction ceremony will likely be held the day prior to the first preseason game, with a halftime ceremony at the home opener. Fri April 21: Deadline for Restricted Free Agents to sign offer sheets with other teams. April 27-29: NFL Draft, Philadelphia PA. Round One is on Thursday April 27 starting at 8 pm. Rounds 2-3 take place on Friday April 28, beginning at 7 pm. Rounds 4-7 will be on Saturday April 29, commencing at noon. Sat April 29: Teams may sign undrafted rookie free agents as soon as the draft is completed. Mon April 31: Phase Two of OTAs. Same rules as Phase One, except this is for three weeks and all coaches are permitted on the field. Individual and non-contact drills are allowed. No offense versus defense, no helmets. May 5-8 or 6-9: Rookie Minicamp. First option for teams to hold their one three-day post-Draft rookie minicamp; from either Friday through Sunday, or from Saturday through Monday. Tue May 9: Unrestricted Free Agent Tender. Deadline for teams to send “May 9 Tender” to its unsigned Unrestricted Free Agents. If the UFA has not signed a contract with a team by July 22 (or the first scheduled day of the first NFL training camp, whichever is later), he can only negotiate or sign a contract from that date until the Tuesday following the 10th weekend of the regular season only with his old team. May 12-14 or 13-15: Rookie Minicamp. Second option for teams may to hold their one three-day post-Draft rookie minicamp; from either Friday through Sunday, or from Saturday through Monday. Mon May 15: Rookie Football Development Programs begin. 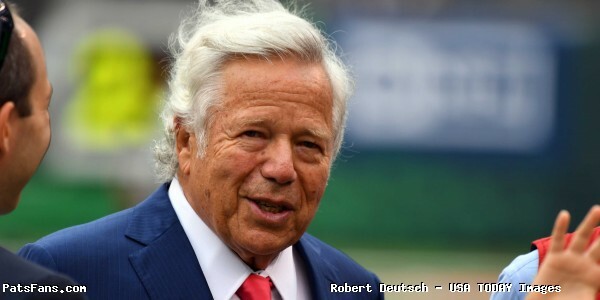 ~ May 18: Winner from fan voting for Patriots Hall of Fame announced. May 18-21: NFLPA Rookie Premiere, Los Angeles CA. Invited Rookies (typically, first and/or second-round selections) must be permitted by their respective clubs to attend. Such players are unavailable for offseason workouts, OTA days, and minicamps during this period. May 22-24: Spring League Meeting, Chicago, IL. Late May-Early June: OTA. Phase Three of Organized Team Activities, with specific dates varying by team. Clubs may have four OTAs in May and four in June. No pads except protective knee or elbow pads, but helmets are permitted. No live contact drills between offensive and defensive linemen. 7-on-7, 9-on-7 and 11-on-11 drills are permitted, provided no live contact takes place. Maximum six total hours per day, with a maximum two hours on the field for any player. Maximum of three OTAs per week for the first two weeks. During weeks one and two a fourth ‘non-OTA’ workout is allowed, but Phase Two rules apply. There are a maximum of four OTAs for the third o fourth week, with the other week being the mandatory minicamp. Thu May 25: Patriots’ OTA, open to media. Wed May 31: Patriots’ OTA. Thu June 1: Patriots’ OTA. June: Mandatory Minicamps, specific dates vary by team. Minicamp must be conducted during the week (Monday through Friday), with physicals taking place on Monday (but no practice or workouts on that day), and then practices on Tuesday through Thursday. Minicamp rules are similar to OTA rules, but Minicamp allows for 10 hours per day, with 3½ hours on the field spread out over two sessions. Thu June 1: Restricted Free Agent Tender. Deadline for team to apply “June 1 Tender” to its unsigned RFA who received a qualifying offer for a Right of First Refusal Only, in order for that player to be subject to the CBA “June 15 Tender” provision. Fri June 2: Salary Cap Implications. For any player released, waived or traded after June 2, any remaining prorated signing bonus amounts for future years will be included fully on the team’s 2018 salary. Tue June 6: Patriots’ minicamp, open to media. Wed June 7: Patriots’ minicamp, open to media. Thu June 8: Patriots’ minicamp, open to media. Mon June 12: Patriots’ OTA, open to media. Tue June 13: Patriots’ OTA. Thu June 15: Patriots’ OTA. Thu June 15: Deadline for teams to withdraw qualifying offer from restricted free agents and still maintain exclusive negotiating rights by substituting “June 15 Tender” of one-year contract at 110 percent of the player’s prior-year salary. June 20-22: Rookie Transition Program. Held by all teams. Attendance is mandatory for all rookies. Topics teams will address with players include social responsibility, respect at work, mental health, character and values and player engagement resources. Replaces centralized Rookie Symposium (infamous for Cris Carter’s ‘get a fall guy’ speech). Sat July 15: Deadline for any franchise tag player to sign a multiyear contract. Any player who does not do so can sign only a one-year contract with his team, and the contract cannot be extended until after the team’s last regular-season game. Thu July 20: Training Camp opens for the two teams playing in the Hall of Fame game. Sat July 22 (or the first scheduled day of training camp, whichever is later): Signing Period ends for UFA to whom a “May 9 Tender” was made by prior club. After this date and until the Tuesday following the 10th weekend of the regular season, prior club has exclusive negotiating rights. Sat July 22: Signing Period ends for Transition Players with outstanding tenders. After this date and until the Tuesday following the 10th weekend of the regular season, prior club has exclusive negotiating rights. July 25-30: Training Camps Open. Teams are permitted to open preseason training camp for rookies and first-year players beginning seven days prior to the club’s earliest permissible mandatory reporting date for veteran players. Veteran players (defined as a player with at least one pension-credited season) other than quarterbacks or injured players may report to training camp no earlier than 15 days prior to the team’s first scheduled preseason game or July 15, whichever is later. Mon July 24: Rookies report to Foxboro for training camp. Wed July 26: Veterans report to Foxboro for training camp. Thu July 27, 9:00 am: Training Camp session #1. Fri July 28, 9:00 am: Training Camp session #2. Sat July 29, 9:00 am: Training Camp session #3. Sat July 29, noon: Patriots Hall of Fame induction ceremony for Raymond Clayborn. Sun July 30, 9:00 am: Training Camp session #4. Thu Aug 3: Hall of Fame Game, Canton OH. Sat Aug 5: Hall of Fame enshrinement ceremony, Canton OH. Mon Aug 7: Training Camp joint practice session with Jacksonville Jaguars. Tue Aug 8: Training Camp joint practice session with Jacksonville Jaguars. Tue Aug 8: Deadline for players under contract to report to their clubs to earn an accrued season for free agency purposes. Tue Aug 8: If a drafted rookie has not signed with his club by this date, he cannot be traded to any other club in 2017, and may sign a player contract only with the drafting club until the day of the 2018 draft. Aug 10-14: Preseason Week 1 NFL games. 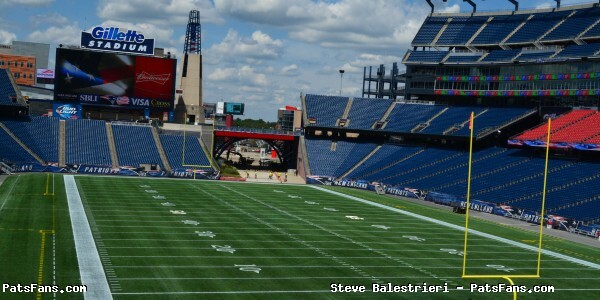 Thu Aug 10, 7:30 pm: Jacksonville Jaguars at New England Patriots. Aug 12-16: Each club has until five days prior to its second preseason game to provide any tendered but unsigned Exclusive Rights Player or Restricted Free Agent with written notice of the club’s intent to place the player on the Exempt List if the player fails to report at least the day before the club’s second preseason game. Once such notice has been provided, the club must place the player on the Exempt List. While on the Exempt List, the player will not be entitled to compensation for up to three regular-season games, depending upon the date the player reports to the club. Aug 17-21: Preseason Week 2 NFL games. Sat Aug 19, 8:00 pm: New England Patriots at Houston Texans. Aug 23-27: Preseason Week 3 NFL games. Fri Aug 25, 7:00 pm: New England Patriots at Detroit Lions. Aug 31-Sept 1: Preseason Week 4 NFL games. Thu Aug 31, 7:30 pm: New York Giants at New England Patriots. Sat Sept 2: Roster Cuts. Teams must reduce rosters to a maximum of 53 players on the Active/Inactive List. Sat Sept 2: Simultaneously with the roster cut-down to 53, clubs that have players in the categories of “Active/Physically Unable to Perform” or “Active/Non-Football Injury or Illness” must select one of the following options: place player on “Reserve/Physically Unable to Perform” or “Reserve/Non-Football Injury or Illness”, whichever is applicable; request waivers; terminate contract; trade contract; or continue to count the player on the Active List. Sun Sept 3: Claiming period for players placed on waivers at the final roster reduction will expire at 12:00 noon ET. Sun Sept 3: Claiming period for players waived during final roster cuts ends at 12 noon. Sun Sept 3: Teams may sign up to ten players to their Practice Squad, starting at 1:00 pm ET. Sun Sept 3: All tryouts on this date and for the remainder of the season must be reported to the league office. Mon Sept 4: Required filing of injury reports and game status goes in to effect. Thu Sept 7: Top 51 Rule expires and all teams must be under the salary cap for their full roster. Thu Sept 7, 8:30 pm: 2017 regular season commences with Kansas City Chiefs at New England Patriots, on NBC. Sept 10-11: Remainder of NFL Week 1 games. Sept 8, 11-12: Any veteran player with at least four previous pension-credited seasons who is released after week one is entitled to termination pay after the end of the season (contract guaranteed). Sun Sept 17, 1:00 pm: New England Patriots at New Orleans Saints, on CBS. Sun Sept 24, 1:00 pm: Houston Texans at New England Patriots, on CBS. Sun Oct 1, 1:00 pm: Carolina Panthers at New England Patriots, on Fox. Thu Oct 5, 8:25 pm: New England Patriots at Tampa Bay Buccaneers, on CBS. Sun Oct 15, 1:00 pm: New England Patriots at New York Jets, on CBS. Mid October: IR. One player per team per season can return from Injured Reserve to the Active Roster. That player has to have been on IR for at least six weeks. Oct 13-17: PUP. Beginning on the sixth calendar day prior to a club’s seventh regular season game (including any bye week) and continuing through the day after the conclusion of the 11th regular season weekend, clubs are permitted to begin practicing players on Reserve/Physically Unable to Perform and Reserve/Non-Football Injury or Illness for a period not to exceed 21 days. Players may be activated during the 21-day practice period, or prior to the day after the conclusion of the 21-day period, provided that no player may be activated to participate in a Week 6 game. Oct 17-18: Fall league meeting. Sun Oct 22, 8:30 pm: Atlanta Falcons at New England Patriots, on NBC. Sun Oct 29, 1:00 pm: Los Angeles Chargers at New England Patriots, on CBS. Tue Oct 31: trade deadline. Wed Nov 1: Players with at least four previous pension-credited seasons are subject to the waiver system for the remainder of the regular season and postseason. Nov 2-6: NFL Week 9 — bye week for Patriots. Sun Nov 12, 8:30 pm: New England Patriots at Denver Broncos, on NBC. Tue Nov 14: signing period ends for those playing under a franchise tag. Any players tendered, franchised or drafted rookies who had not signed those offers to this point are now not eligible to play for the rest of the season. Sun Nov 19, 4:25 pm: New England Patriots vs Oakland Raiders in Mexico City, on CBS. Sun Nov 26, 1:00 pm: Miami Dolphins at New England Patriots, on CBS. Mon Dec 1: clubs can tryout and negotiate with CFL players whose contracts are about to expire, through January 31. Sun Dec 3, 1:00 pm: New England Patriots at Buffalo Bills, on CBS. Mon Dec 11, 8:30 pm: New England Patriots at Miami Dolphins, on bspn. Tue Dec 12: NFL management council labor seminar. Wed Dec 13: league meeting. Sun Dec 17, 4:25 pm: New England Patriots at Pittsburgh Steelers, on CBS. Sun Dec 24, 1:00 pm: Buffalo Bills at New England Patriots, on CBS. 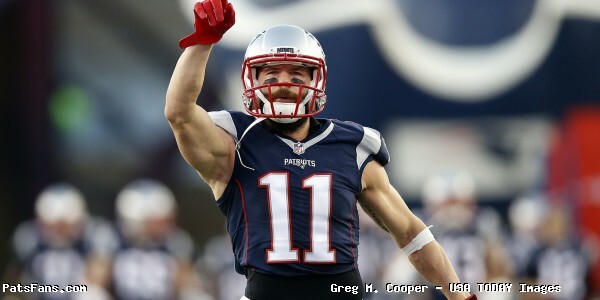 Sun Dec 31, 1:00 pm: New York Jets at New England Patriots, on CBS. Mon Jan 1, 2018, Salary Cap: clubs must provide the amount, if any, of their 2017 cap room to be credited towards their 2018 team salary. Jan 1-Feb 5: Once a team’s season is over they can sign practice squad players to futures contracts. Jan 1-7: Assistant coaches under contract to playoff clubs that have byes in the Wild Card games may be interviewed for head coaching positions through the conclusion of the Wild Card games. Jan 6-7: Wild Card Playoff Games. Mon Jan 8: college football national championship game. Jan 7-14: Assistant coaches under contract to playoff clubs that won their Wild Card games may be interviewed for head coaching positions through the conclusion of the Divisional Playoff games. Jan 13-14: Division Round Playoff Games. Mon Jan 15: Deadline for college players that are underclassmen to apply for special eligibility. A list of players who are accepted into the NFL Draft will be sent to clubs on January 19. Sat Jan 20: East-West Shrine Game, St. Petersburg FL. Sun Jan 21: Conference Championship Games. Sat Jan 27: Senior Bowl, Mobile AL. Sun Jan 28: Pro Bowl, Orlando FL. Sun Jan 28: An assistant coach whose team is participating in the Super Bowl, who has previously interviewed for another club’s head coaching job, may have a second interview with such club no later than the Sunday preceding the Super Bowl. Tue Jan 30: Deadline for NFL clubs to try out and negotiate with CFL players whose 2017 contracts are due to expire. Sun Feb 4: Super Bowl 52, Minneapolis MN. Mon Feb 5: Waiver system begins for 2018. Tue Feb 6: Hopefully another parade through the streets of Boston. Tue Feb 13: Teams may begin to sign players whose 2017 CFL contracts have expired. Players under contract to a CFL club for the 2018 season or who have an option for the 2018 season are not eligible to be signed. Wed Feb 14: First day for clubs to designate Franchise or Transition Players. This entry was posted in NFL Commentary and tagged 2017 free agency, 2017 NFL Draft, 2017 NFL Free Agency, 2017 NFL season, 2017 Patriots Season, calendar, free agency, NFL, NFL Calendar, NFL Free Agency, Patriots draft on March 2, 2017 by John Morgan. On Friday the National Football League announced the allocation of 33 compensatory draft picks for the 2016 NFL Draft, which will be held April 28-30. The New England Patriots received the maximum four compensatory picks: one in the third round, and three in the sixth round. With that news the Pats slots in April’s NFL draft has been set. Compensatory draft picks are allotted to teams that lost an unrestricted free agent to another team in the previous off-season. Although the formula has never been made public, it has been determined that it is based primarily on the compensation that the player received from his new club, along with an adjustment for playing time and a smaller adjustment for post-season honors. Players who were released by their former team do not count in the formula, nor do players who sign with a new club after June 1. Last year the Patriots lost cornerback Darrelle Revis in an obvious but not penalized textbook tampering scenario. The Pats also lost defensive tackle Vince Wilfork, corner Brandon Browner, running backs Shane Vereen and Stevan Ridley, and linebackers Akeem Ayers and Jonathan Casillas in free agency. The only compensatory qualified free agent that New England signed was defensive end Jabaal Sheard. With the compensatory draft picks now known, the initial arsenal of draft picks that the Patriots own has been finalized. Earlier this year the NFL decided to change the rule compensatory could not be traded. The fact that the league decided to implement this rule change next year rather than in 2016 surely has nothing to do with the fact that the Patriots would be receiving several comp picks (/sarcasm). – The first round pick (29th overall) was stolen by Roger Goodell in the league’s attempt to smear Tom Brady the Patriots, and give the commissioner full power over the players and the NFLPA. – The fifth round pick (154th overall) was traded away to the Houston Texans on September 17, 2015 for WR Keshawn Martin and Houston’s sixth round pick (196th overall). – The sixth round pick (204th overall) was traded away to the Chicago Bears on September 29, 2015 for LB Jon Bostic. – A seventh round pick (243rd overall) was acquired from the Houston Texans in exchange for QB Ryan Mallett on August 31, 2014. This entry was posted in Patriots News and tagged 2016 NFL Draft, Akeem Ayers, Brandon Browner, Chicago Bears, compensatory draft picks, Darrelle Revis, Deflate Gate, DeflateGate, free agency, Houston Texans, Jabaal Sheard, Jon Bostic, Jonathan Casillas, Keshawn Martin, New York Jets, NFL, NFL Free Agency, Patriots history, Roger Goodell, Ryan Mallett, Shane Vereen, Stevan Ridley, trade, Vince Wilfork on March 11, 2016 by John Morgan. The Patriots suffered a slew of injuries in 2015, and ended up with 21 players on injured reserve. The running back position was no exception with both starters, Dion Lewis and later LaGarrette Blount being lost for the year. This was compounded by the early season losses of Tyler Gaffney and fullback James Develin. So the Pats brought in veteran Steven Jackson who has a Hall of Fame resume but hadn’t played at all in nearly a year after closing out 2014 with the Falcons. Jackson appeared all but retired, and stated he didn’t want to return unless he had a chance to appear for a Super Bowl berth. The Patriots signed the 32-year old running back and he appeared in the final two games of the regular season and gained just 50 yards on 21 carries with a touchdown, which was more a statement on the state of the offensive line than him. His one shining play was a 20-yard catch and run in Miami he had on a pass from Tom Brady. In the post-season facing two very good run defenses in Kansas City and Denver, Jackson had 24 yards on 10 carries with a touchdown (his first professional post-season score) against Denver in the AFC Championship Game. Now both he and the Patriots have a decision to make, does he want to come back for one more chance at a ring with a team that is always in the hunt or does the back who will turn 33 right around the time of training camp decide to call it a career after gaining 11,435 yards and 69 touchdowns in his time? Had the Patriots made the trip to Santa Clara this week, that question would be a no-brainier, but now there still remains a sliver of hope for him to try it one more time. Do the Patriots entice him back for a final chance and give him the opportunity to not only win a spot on the roster but contribute meaningful snaps for the offense? Or do they go with either different, younger players in free agency and/or the 2016 NFL Draft? Jackson obviously wasn’t the player he was back about 7-8 years ago when he was a dual threat both running and catching the football out of the backfield. But his meager stats in four games weren’t the result of him having nothing left in the tank either. He is still a serviceable running back and he was in surprisingly good shape for someone who hadn’t played in nearly a year. 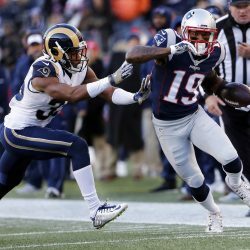 Why Jackson Will Return: Jackson got a small taste of what the Patriots can bring to the table offensively when the playoffs started with an almost healthy receiving core. Starting a season with an upgraded and healthy offensive line and the return of Dion Lewis would be a bonus. They won’t be asking him to carry it 20+ plus times per game, but contribute as a role player at this stage of his career, something he’s still capable of doing. He’d still have to win a job during training camp as they’ll undoubtedly bring in some younger talent during the spring. But Bill Belichick has always admired him and loves his veteran presences on a team. He could be signed for the veteran minimum with the chance to hit some incentives along the way. Why Jackson Won’t Return: The Patriots will most definitely look to add youth in the upcoming draft at the end of April and thru free agency. As in the case with Blount, they could extend an offer for a chance to come back and win a job in July, but may decide that it is just time to move on. In Jackson’s case, his comments when he signed, sounded like someone who was all in 2015. He may just decide that his bust in Canton will not involve having a Super Bowl ring attached to it. Bottom Line: There is always a chance that Jackson returns for a final swan song for his career. Belichick loves veterans who can lend leadership along the way when the going gets tough. Players like Brian Cox, Roman Phifer, and Ted Washington all come to mind when thinking about those earlier Super Bowl teams. He admires Jackson and spoke about spending an entire day with him when evaluating him for the draft when SJax was a rookie. There is a slight possibility of them asking him to come back for one more shot. But I think that Jackson will take the decision out of the team’s hands. I believe that he’s going to call it a career and ride off into the sunset and explore other career opportunities closer to home. The odds on him retiring are about 80 percent. The small chance of him not doing that is the fact that he hasn’t announced it yet. I’m sure he’s coming to that decision and will announce it soon. This entry was posted in Patriots Commentary, Patriots News and tagged 2015 NFL Post season, 2015 NFL Season, 2015 Patriots, 2015 Patriots Season, 2016, 2016 free agents, Bill Belichick, Dion Lewis, free agency, James Develin, LaGarrette Blount, New England Patriots, NFL, Patriots, Patriots running backs, Steven Jackson, Tom Brady, Tyler Gaffney on February 2, 2016 by Steve Balestrieri. And, compared to other teams, the Patriots are a bit behind in terms of looking at impending free agents and free agency in general as they’ve had their eyes on the postseason. It is a familiar problem and one that that they’re used to dealing with. The Patriots currently have 74 players on the roster, the 53-man unit that faced Denver in the AFC Championship and 21 players who are on IR. Of those 74, the team has 11 un-restricted free agents, four restricted free agents and three exclusive rights free agents, those players only the Patriots can make offers unless they decide to let them go to free agency. We’ll break down the roster by position and list the free agents for the team. In the coming days and weeks, we’ll break down each free agent individually and make a case for them to stay or go as the team will have a lot of thinking to do. 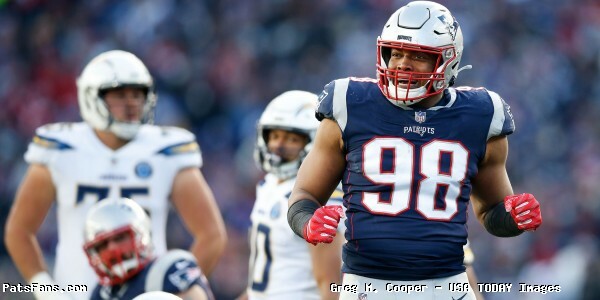 This entry was posted in Patriots Commentary, Patriots News and tagged 2015 NFL Season, 2016 Patriots Roster, 2016 Patriots season, 53 Man Roster Projection, Bill Belichick, Brandon LaFell, Chandler Jones, Danny Amendola, Dion Lewis, free agency, free agents, Jabaal Sheard, Jimmy Garoppolo, Julian Edelman, LaGarrette Blount, Malcolm Butler, New England Patriots, NFL, Patriots, Patriots edge rushers, Rob Gronkowski, Rob Ninkovich, Tom Brady on January 27, 2016 by Steve Balestrieri.